I am so excited welcome Michelle from Healthy Recipes Ecstasy. I found Michelle’s absolutely gorgeous food over the Summer when I was looking for some healthier recipes. It was heaven the moment I dropped onto her site. Be sure to stop by and enter to win the NINJA Supra Kitchen System that she is giving away! As well as check out Cupcakes & Kale Chips for some Healthy Desserts or Love Bakes Good Cakes for some Healthy Meal Ideas for our #EatHealthy15 Series. Hey NY Melrose Family readers! Michelle here from Healthy Recipe Ecstasy. I’m super excited to be guest posting on the NY Melrose Family! Today, I’m going to share with you one of my absolute favorite healthy snacks: Two-Ingredient Almond Butter Dark Chocolate Fruit Fondue. That’s right – it’s only two ingredients (plus fruit for dipping). 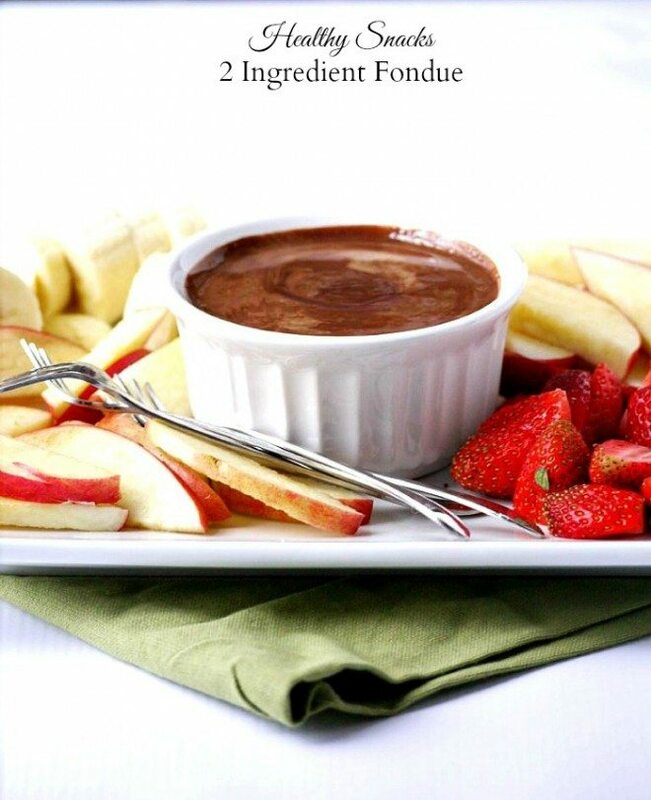 You can probably throw this snack together in less time than it takes to say Two-Ingredient Almond Butter Dark Chocolate Fruit Fondue. Have you noticed how a lot of the fall and winter holidays seem to be focused on chocolate? Halloween is obviously the candy holiday. Chocolate usually makes its way into Christmas treats. And, well, we all know that the best Valentine’s Day gift is a big box of chocolates (at least in my house). In my world, there’s no such thing as chocolate overload but there is such a thing as chocolate candy guilt. As in, I really need to lay off the chocolate candy after the holidays. Fortunately, this recipe eases my chocolate craving and leaves the guilt in the trash with all that crumbled holiday wrapping paper. I use a high-quality dark chocolate (70 percent or higher) to maximize antioxidants and minimize unnecessary sugars and fats. Mixed together with nutty almond butter it’s the perfect little swimming pool for your fruit or for my Easy Spiced Almond Date Balls. I am totally obsessed with the dark chocolate-almond butter mixture. It’s healthy enough for a snack but decadent enough for dessert. Along with this quick and easy healthy snack, I’m also sharing an awesome giveaway for a Ninja Supra Kitchen System. I would love to have one of those in my kitchen! You can enter the giveaway HERE so stop on over to enter to win. 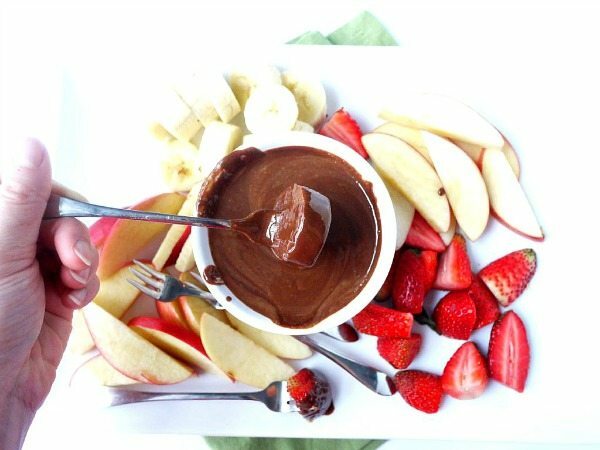 A decadent but lightened two ingredient fondue with fresh fruits that are the perfect healthy snacks. 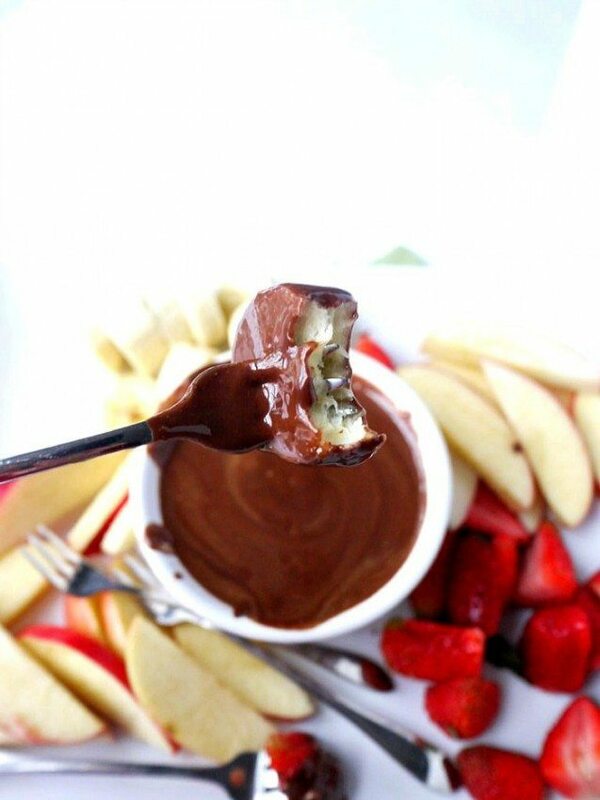 Melt dark chocolate in a small bowl in the microwave at 30-second intervals. Pour almond butter into the bowl with the melted chocolate and microwave the mixture for another 30 seconds. Stir until combined. Serve with fresh fruit. 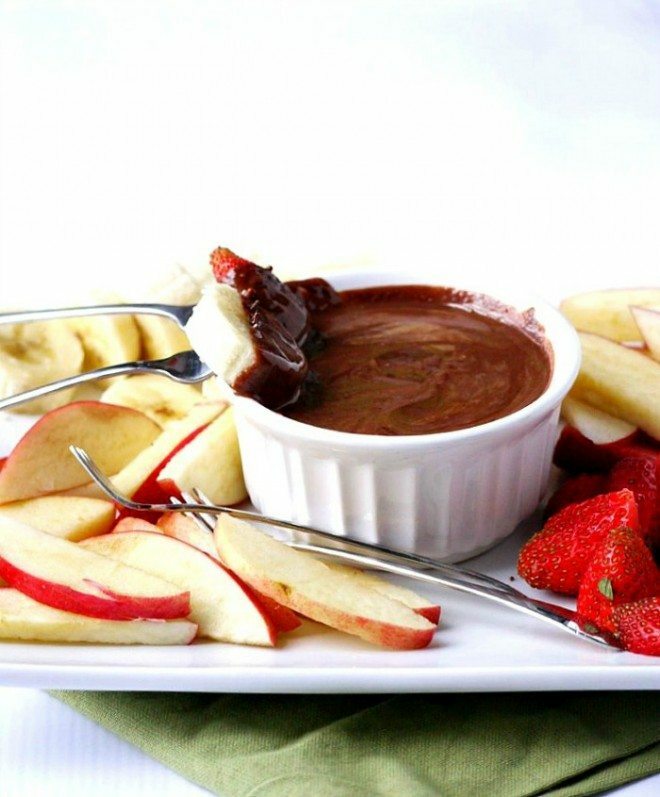 My favorite fruit combinations with the “fondue” are apples, bananas and strawberries. 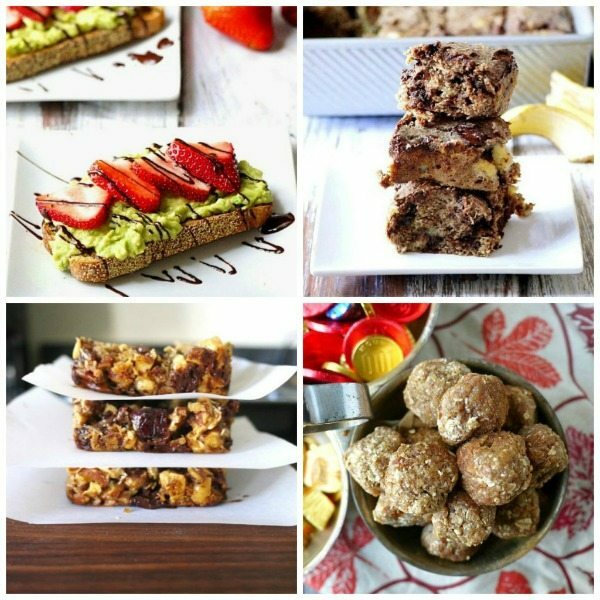 Michelle blogs over at Healthy Recipe Ecstasy. She’s an attorney, wife, and mother of two adorable cats who has a lifelong passion for food and a baby on the way. She loves traveling, eating out and testing healthy recipes in her D.C. kitchen. Nothing brings her more joy than a healthy comfort food makeover! This looks so delicious, Michelle, and I love the healthy simplicity! The best dishes sometimes have the fewest ingredients and I can hardly wait to make this for my NY’s buffet. Strawberries and chocolate are a combination created by the gods of food! Great recipe! I am so trying this! Love Almond Butter and of course I LOVE chocolate, who doesn’t?